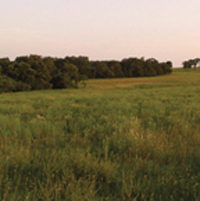 Though it is true... much can be said to have been lost... we can rebuild healthy grasslands by starting right here. The melding of meadows and prairies amongst the wooded areas is known as a savannah. The grasses can return us to sustainability... by offering their strongest traits of being the survivors during times of drought. Thrives east of I-35 to the Atlantic Ocean. For even more diversity, consider adding our Caddo Wildflower Mix in the fall, after your new savannah grasses take hold.